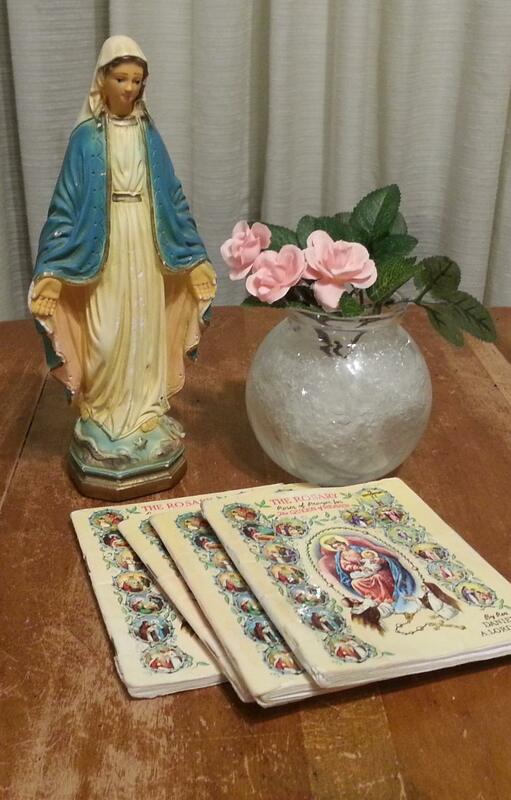 The Promises of the Rosary: Praying with a statue of Mary and rosary booklets can help you and your children pray well. 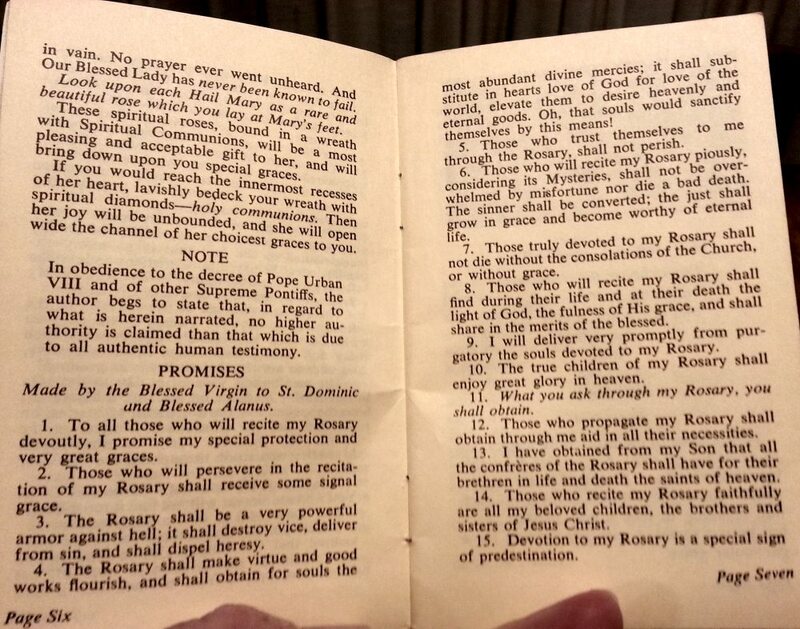 The 15 Promises of the Rosary were published by TAN, with an Imprimatur by Patrick J. Hayes, Archbishop of New York on little blue cards. I'm glad my mother kept one, the promises are so consoling. My parents said the Rosary nearly every day of their married lives. In spite of giant hurdles in life they each died a peaceful death with all of their local children praying the Rosary at their death beds. Both had lived the evidence of many of the other of these promises by the end of their lives and had then received the sacraments of the Church (Promise number seven) before they passed to eternity. These Promises were given by the Blessed Virgin Mary herself. The Rosary is one of the most highly indulgenced devotions of the Catholic Church! It comes second only behind the Mass and the Office in importance and it takes its place way ahead of the Stations of the Cross. 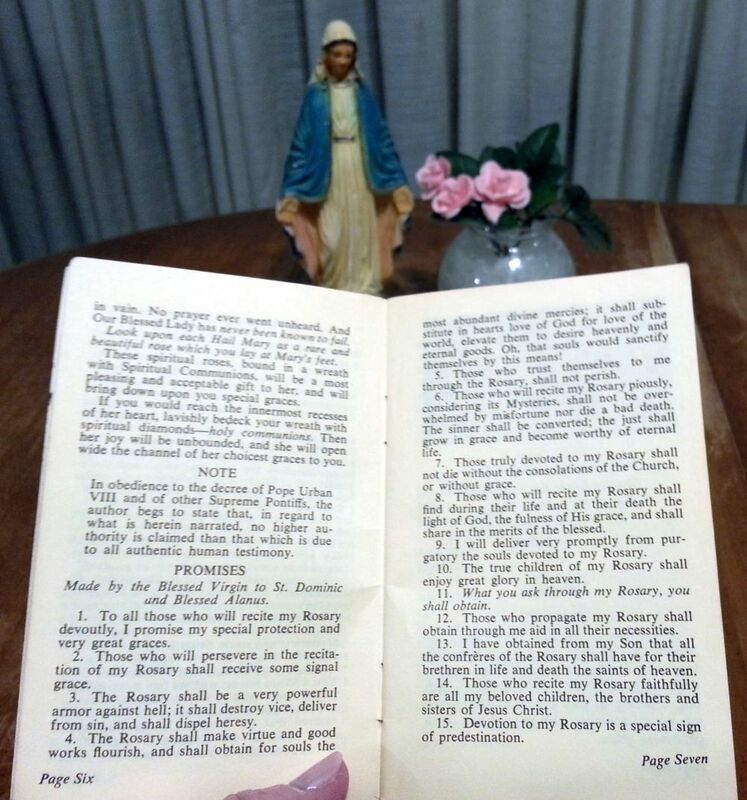 Mom had a booklet with the words to the Fifteen Promises of the Rosary by Benziger, Imprimatur - Francis Cardinal Spellman. -- Promises of the Rosary, Blue Card published by TAN Books, Imprimatur: Patrick J. Hayes, D.D. ; Archbishop of New York, USA. St. Anne's Helper's Rosary videos of the 15 Mysteries of the Rosary help you meditate on the individual Mysteries of the Rosary as Our Lady asked at Fatima. Use the Catholic Rosary Video with your daily Rosary whether you use it in your living room with the family or set it up on a phone or other mobile device for someone in the hospital. Remember that when you promote the Rosary or teach it to others you will receive the benefits mentioned in the Promises of the Rosary. The images in the video have the words to the prayers and a moving image of which bead to use. The beads turn from blue to magenta to indicate the right prayer, the text of the prayer shows the prayer that is being said, finished beads change to a golden color in honor of the Queen of Heaven, and there is no added music. The images of Jesus and Mary help you meditate on the Mysteries of the Rosary. It's very helpful when we can pray with others. I know that when our family prays the Rosary with Daddy leading, or one of the children for practice, it's easier for me to pray the Rosary well. When you use a Rosary booklet, it is easier to meditate on the Mysteries of the Rosary as Our Lady of Fatima asked us to do on the First Saturday of five consecutive first Saturdays. You can watch these Rosary videos and display them on your computer or a big screen for your daily Rosary. My husband uses them on his way home from work on his phone. You can also use a tablet for easy viewing. You can renew your intentions with a booklet that has the Promises of the Rosary.